Not every game has aged as gracefully as the 1995 Super Nintendo title, Yoshi’s Island. Even by modern standards, the distinctive hand-drawn aesthetics present from start to finish within this release have withstood the test of time. So, how exactly did the art style for one of Yoshi’s earliest outings come about? We did a number of trials where we’d think, okay, let’s do some actual hand-drawn drawings, scan those, and then figure out how we can take these scanned images and turn them into Super Nintendo graphics. After repeating that process a number of times, we kind of hit on a way we could take these scanned-in images and use what was in our head during the process of drawing them and what we were seeing on the page to actually get them on screen and keep them looking like hand-drawn images. What that involves is, when we made images for the Super Nintendo, we’re actually filling in spaces. In this case it was a pixel at a time, basically to match the scanned image we’d hand drawn, and carefully fill them in to make sure they still looked like that. It was kind of like I had a hand-drawing rendering engine in my head that was guiding my hand while I was filling in pixels, to make sure they looked that way. It took quite a bit of time. It goes to show just how much time and effort can pay off when a game such as this still looks just as impressive as it did the first day it was released. 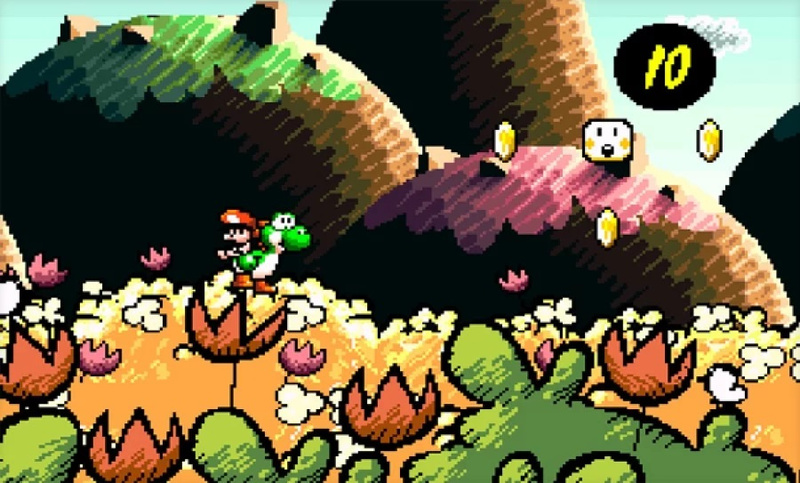 Do you think Super Mario World 2: Yoshi's Island has aged well? Tell us in the comments below. I prefer Super Princess Peach NDS due to similar BG like Yoshi's Island. One of my most beloved games of all time, and yes, it's still beautiful. Yep an all time favourite. The look, the soundtrack, the level design, the challenge. It's got everything. As perfect a game as there can be. I so hope they bring it to the Switch eventually.That it took them until the release of the SNES mini to give gamers a chance to play the original masterpiece is almost criminal. The GBA version is very good but the SNES original is so much better. Funny how some companies try finding ways to cut corners, while Nintendo put so much effort into every pixel of their games. For some reason I've never beaten this game, but yeah, it's gorgeous. The art has held up very well. I'll be the odd one out and say I've never liked this game as much as others. It's good, but I prefer SMW and SMB3. It does have a really great art style though. Funnily enough I've just started playing it for the 2nd time on the GBA! I'm a little late to the party I know, but it's great, some will argue its the inferior version, but it's portable and I always take my GBA away with me for holidays! Funny, I was just playing this last night on My SNES Classic. Not only is the art style gorgeous, but to this day, it is still one of my favorite platformers of all time. Such a timeless gem. This and DKC2 are my favorite 2D platformers. Both are masterpieces. The final boss of Yoshi’s Island absolutely blew my young mind at the time. Yeah, a genuinely gorgeous game that holds up flawlessly over time. The pixel art on top of the unique art style and aesthetic just makes it look even more charming today. Note: It really would have been nice, useful, and indeed professional to have a few more high quality images/gifs and maybe even some video footage of the game in the actual article for people to get a clearer and better example of what you're talking about, particularly for some of the new gamers who might not have seen the original Yoshi's Island much before. @justin233 I played it for the first time really late,on Wii U VC.And yet the final boss still had the same effect on me. That's seriously gorgeous visuals right there, and some of the best and most stylish pixel art to come from the 16-bit generation. I used to play this when I was younger, but I never got around to finishing it for some reason. The art style is really unique. I don't know why I avoided this game in the 90's. Maybe because of the hand-drawn style and the hearsay about how annoying the baby noise was! I associated Mario with the SMW graphics and not something that looked "childish". Over the years, I never garnered the interest to at least give it a shot despite all the remakes and re-releases. Heck, I played Super Princess Peach before this game! And I loved Super Mario RPG and Donkey Kong Country, each with their distinctive non-traditional graphics. What have I been missing all these years! I feel as if I'm playing a newly released game from a time warp! I should have never denied myself the pleasure. Can anyone comment if the DS version is anymore "enhanced"? Its beautiful game with well designed levels. I'm a huge Mario and Yoshi fan. But sadly I find the baby Mario loss mechanic (and associated noise) so annoying, it puts me off playing the game, compared to nearly any other 2d 1st party Nintendo platformer. I've never finished it because of this, despite trying multiple times over the years. Sorry. Maybe there is an Action Replay or similar device code that can make it so you never lose Mario. Then I could properly enjoy playing through the platforming on each level. One of the few I never played back then. Tried it recently and thought it was okay, I'd probably liked it more if I did play it back then. Some games are just like that with me, can't hold the same interest as when I was younger. I'm not such a big fan of this one as others are. Though others praise the level design, I found that to be somewhat lacking. I didn't like the pace of the game as well. But I understand why people like it. It wasn't my style, though I really did want to like it more because of the visuals and Yoshi. It's a beautiful game to look at. In some ways, when I played Wonder Boy in Monster World, some parts of that game reminded me of Yoshi's Island as they have that coloring-book look to them as well. Of course, Yoshi's Island took that much farther. I never bothered to pick this game up when it originally came out as I didn't think it should carry the Super Mario World name, seeing as you're playing as Yoshi and not Mario. What a fool I was (even though I still feel it shouldn't have been labeled as SMW2). @Magrane If by DS version you mean Yoshi’s Island DS or Yoshi’s New Island, they are both pretty lackluster. DS has other baby characters which was interesting (will we ever see Baby DK or Wario again?) but IMO didn’t work very well. New was just bland. The best “sequel” to Yoshi’s Island is Woolly World IMO. Hopefully Yoshi 2019 is as good as Woolly World. Best game, ever! Best graphics, best gameplay (tough, too! ), best music...even best "most awful sound effect ever," the crying baby. OMG, that crying gives me PTSD. For some reason, I can't get into the WiiU and 3DS versions as much. I love the graphics, the music, though, is pretty "meh." It is cute and all, but nowhere near the bright, fun, cheerful & thematic music of the original. @Magrane, @justin233 is spot on. Yoshi's Island DS is probably the most faithful overall to the original, but went a little overboard showcasing the dual-screens of the DS. For some reason, I prefer the controls and controller of the SNES version, even though the GBA version isn't that different (the SNES controller is perfection for that gen). Thank you Lone Beagle and justin233! Is Yoshi's Island DS a sequel or remake? @Magrane Sequel but I don’t remember the story details as it’s been years since playing it. Edit: Kamek kidnapped Luigi again. DS and New are worth playing, but they just don’t have quite the charm of the original. Don’t get me started on Yoshi’s Story (not a fan). Yoshi's Island was different and a nice lookoing game. Just didn't feel like a Mario game to me. This game will never age. Amazing art and sound design. I will never forget fighting Burt the Bashful for the first time, which set the tone for the rest of the game. Also: Touch Fuzzy, Get Dizzy. Best level in any game, ever. I had hoped that the Switch version would have changed the style a bit. Love the original art feel but honestly my fav was when they released the first ever images/footage of Yoshi’s Island 64. And then the whole fruit collecting ruined it for me. The only thing in this game that did not age well is that damn baby mario (pun intended). I wish it was just Yoshi, then this would be a perfect game. Now it's just 9.5/10 in my eyes. I like the first SMW better. This is the quality of x-bit game we should be seeing on Switch, together with a long gameplay with a challenge adjust to modern times. But this style and overall magic feeling is what I expect from a 2D platforms... and can’t find it anywhere. Suggestions? The game still looks great! never knew there was so much efford be made in this title. well it defines nintendo back in those days, they took risks and the time to develop products. also the best nintendo console ever made, it was so powerfull when it launched. still hope one day we see another new console, that blows away every competition. on the otherhand i can understand them, other brands make loss and have to sell alot of consoles to make profit, nintendo always make profit. yoshi island was an remarkable project, it is still one of my favorite platform game ever, it had everything, good graphics, adventurious, and one of the best ingame music ever made, almost every track is a classic. wooly world was also very fun to play, but i dont like the normal setting such as the n64 version, and the uocommimg version, it just look so plain. 24 years later, yoshis island is one of the few titles i still play once in a while. One of my all time favorite platformer. Such a marvelous piece of art. This is the "Big N difference" that I love ! I'm not a huge fan of the art style, but I think a Kirby game using this art style would be great. It's one of the examples of how art direction is more important than fidelity. Though I like softer style in Kirby's Dreamland 3 a lot more. So...Basically Nintendo used MS paint. Lol.